Mr Tang Tiong Yew is a PhD candidate at Monash University Sunway Campus, Malaysia. His research interest is building a cognitive humanoid robot intelligent system with video semantic concept detection technologies. He co-developed and facilitated a workshop for the Monash University Sunway Campus School of IT’s “Intelligent Systems Boot Camp 2011” event. The objective of the IT Boot Camp is to promote awareness of ICT among young Malaysians. The main sponsor of the event was the Multimedia Development Corporation (MDeC) which directs and oversees Malaysia’s National ICT (Information & Communication Technology) Initiative. Android mobile software development and artificial intelligence are two units offered by the university. Therefore, the combination of Tang’s personal robotic interest together with the school’s ICT awareness promotion agenda, a new concept of robotic competition for non-programmer emerged. The idea is to teach young student participants in a workshop to use LEGO NXT robot with combination of Appinventor technology as controller of the robot. It is an ambitious task for a non-programmer, but thanks to Appinventor technology participants were able to build a working competition robot’s software in just two days! The whole process involved a lot of fun and excitement along the way for the young participants. Tang coined this new robotic sport game as “The Droidball Championship”. Some of the Droidball rules and regulations ideas were brainstormed with Dr. Simon Egerton and Ms. Tan Ee Xion. The Intelligent System Boot Camp 2011 attracted around 70 participants and most of them are high school students. During the first day, students were taught the basic computer science knowledge and were introduced to Appinventor technology via a hands-on tutorial. On second day of the event, each group was given robot competition tasks and they were required to develop a robot controller to effectively solve the tasks. The task was to control the robot and gather balls by putting them in their own colored boxes in order to score points. Different colored balls have different points and the participant’s robot is also permitted to steal the balls from the other participants’ box! As a result, the controller of the robot also has to strategize and have the robot act as a goal keeper to guard its own box. 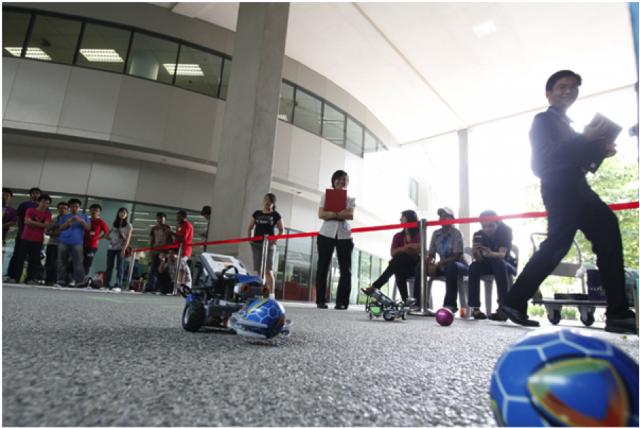 The participants were given freedom to implement their own features (e.g., speed controller, button location and etc) to optimize their chances of winning the robot competition. It was amazing to see the participants’ enthusiasm and creativity in developing new features to win the competition. 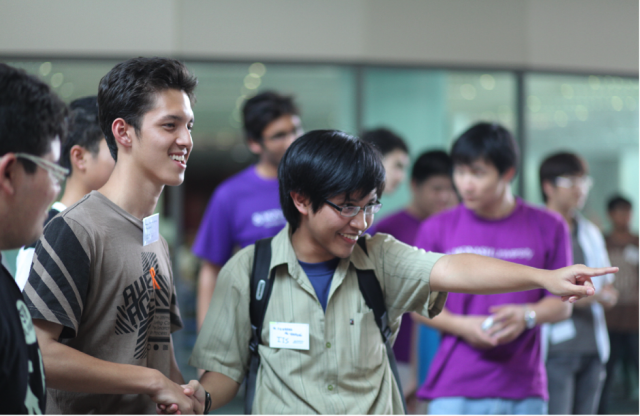 The robotic competition also cultivates team building spirit among them (e.g., some of the participating teams strategized their own game plan).